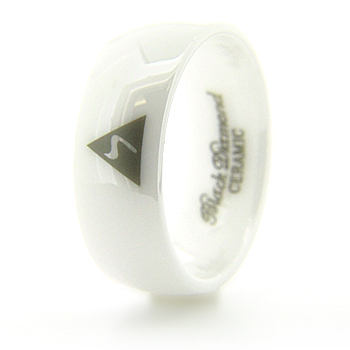 Scottish Rite ring is made of solid white ceramic. 14th degree / yod symbol is laser engraved. Domed ring has a polished mirror finish. Ring width: 8mm, thickness: 2.5mm. Comfort fit. Available in half and whole finger sizes, 5-11. Weight: approx 10 grams. Made in USA.